Defence is one of RuneScape's most important Combat skills. Unlike popular belief, Defence does not decrease the amount of damage inflicted upon you. Instead, it determines how often a foe will hit you, and it allows you to wear better armour types. To view your defence class, first click on the Worn Equipment icon on your Control Panel toolbar. This icon looks like a helmet and is located to the right of Inventory icon. Once selected, you will see your currently worn equipment. Now, click on the Equipment Stats icon located at the bottom of the Worn Equipment screen to view the Equipment Bonuses window. This screen contains an enlarged version of your character, as well as the current bonuses offered by your equipment. The different classes are Stab, Slash, Crush, Magic and Ranged. The more you have in a Defence class, the better your Defence against that type of attack is. The better the armour, the more Defence you will have. Different armours give different bonuses. Slash - This protects you from slashing attacks, such as claws and swords. Magic - Protects you from Magical attacks and increases chances of magic and dragon breath missing on you. Absorb Melee - The percentage of inflicted Melee damage which is reduced by the player's equipment. Absorb Magic - The percentage of inflicted Magic damage which is reduced by the player's equipment. Absorb Ranged - The percentage of inflicted Ranged damage which is reduced by the player's equipment. There are different kinds of armour for each kind of combat, including Melee, Ranged and Magic. Ranger armour is generally lightweight, allowing maximum mobility for Ranged attacks. It has strong Defence against Magic. It is a good all-around type of armour. This armour drains low stamina while running. Note: For advanced Ranger armour, although the body armour needs a certain Defence, the Vambraces and Legs require no specific Defence level. More about stat bonuses of ranged items can be found in the Ranging Guide. Most of the time this armour weighs quite a bit, and therefore it typically drains a lot of energy while running. It's used for close-range fighting, generally Melee, and it is weak against Magic. This is the most commonly used type. Most of the time this is the lightest armour, and allows magical conjurors to cast spells more effectively. Most have weak Defence for Ranged and Melee attacks, but some types offer the extra protection. This armour drains low or medium stamina while running. More about magical armour stat bonuses can be found in the Magic Guide. Some may believe that Trimmed armour gives extra Defence bonuses, but they do not have any differences in any way in matter of defensive stats. This includes the God armours. Each combat class has it's own type of armour that it benefits from the most. Of course, as long as you meet any requirements for a piece of armour, you can wear it. Not really considered armour, this category contains a lot of RuneScape clothing including Blue Wizard Robes, Priest Gowns, Black Wizard Robes, Zamorak & Monk Robes, HAM & Fremennik Robes, Dwarven & Gnome clothing, Mime & Shades Clothing, and more. This armour is a weak, all-around armour. It is very light-weighted, but it is not good for combat. They are untradeable and obtained at the Rogue's Den. Not really considered an armour type, the Fremennik Helms offer more Defence than a Rune Full. There are different types, which specialize in each class of combat. They're double in price though. 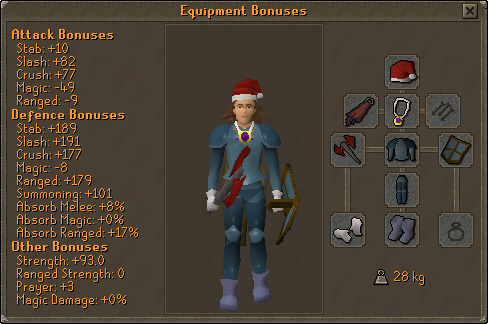 You can buy these after Fremennik Trials Quest. Bronze is the basic armour for warriors, and most new players use this as it is cheap and easy to obtain. It doesn't offer much protection. Iron is the armour that comes after Bronze. There are no requirements, offer a bit more Defence, but are slightly more expensive and harder to obtain. Armour of the dark army, this armour is a bit different in appearance and shades compared to normal iron armour, but it is equivalent to iron nonetheless. Steel is a quite common armour because it's generally inexpensive and offers more protection than Iron or Bronze. The Basic Decorative Armour equipment set includes a helm, platebody, platelegs and shield. It offers equipment bonuses comparable to that of Steel. When the helm, platebody and platelegs are worn during a Castle Wars match, you will inflict an additional 10% damage on your opponents. Black armour is considered uncommon, as it cannot be smithed. It is a quite simple and elegant type of armour, but most people wear it for showing off, not much for combat as some pieces are difficult to find and sometimes expensive. A partially common armour that isn't too expensive and offers good Defence. The Detailed Decorative Armour equipment set includes a helm, platebody, platelegs and shield. When the helm, platebody and platelegs are worn during a Castle Wars match, you will inflict an additional 15% damage on your opponents, as well as an additional 10% damage on Barricades. The bonuses offered by this set are comparable to that of Mithril. Known as the white armour, this armour offers a bit less protection than Mithril, but offers a considerable prayer bonus. It is obtained after the Recruitment Drive Quest. A semi-common armour, used largely by warriors, offers good Defence Not really used in PVP activities. The Intricate Decorative Armour equipment set includes a helm, platebody, platelegs and shield. When the helm, platebody and platelegs are worn during a Castle Wars match, you will inflict an additional 20% damage on your opponents and an additional 10% damage to Barricades. You will also be unharmed by any catapult projectiles. The bonuses offered by this set are comparable to that of Adamant. While this armour looks similar to Temple Initiate Armour, it adds much more Defence to its wearer. Completion of the Slug Menace Quest is required before you can buy and wear this armour. Common and expensive, and it offers great Defence! It's the armour that nearly everyone uses in combat, sometimes expensive to replace, but the high Defence bonuses compensate for that. The Profound Decorative Armour equipment set includes a helm, platebody, platelegs and shield. When the helm, platebody and platelegs are worn during a Castle Wars match, you will inflict an additional 25% damage on your opponents and an additional 10% damage to Barricades. You will also be unharmed by any Catapult or Ballista projectiles. The bonuses offered by this set are comparable to that of Rune. Granite equipment offers slightly less Defence in melee than a Rune, but it has a better magic and ranged Defence. It is also very heavy, and can drain your stamina quite fast. Dragon armour is very expensive and rare, and it offers great Defence, but not many people would use this in a risky combat situation. Some kinds of Dragon armour need certain quests to be completed before being able to be worn. Obtained after the Roving Elves Quest, and not really considered a big category of armour type, the Crystal Shield is a special kind of shield. Obtained after roving elves, this shield offers the best range Defence at 10/10 Points. However, it degrades itself over uses, and loses bonuses until it is repaired. This is a very expensive option, however. This type of armour is rare, and it is currently the most powerful armour in the game, offering bonuses as the sets are collected. They can degrade, but unlike Crystal, they're not as expensive to fix and do not lose bonuses as they degrade. This set is mainly worn for its looks, and has medium Magic and Defence bonuses. Dropped by Bandos and his warriors, the chestplate provides great protection. A very rare drop, it has lower Defence bonuses than Barrows, but provides excellent bonuses and doesn't degrade, it is also one of the only plates in the game giving strength bonuses. One of the rarest platebodies in the game, it is an incredibly rare reward from a level three Treasure Trail. Better than a dragon chainmail, it is a costly plate. Best for bragging rights and not for training. Not considered an armour type yet, the Elemental Shield has no physical protection but offers moderate magical protection. You have to do the Elemental Workshop Quest to make these. A Special Mage armour that does actually offer melee protection as well as good magical bonuses. It is weak against ranging though. After starting the Ghost Robes Mini-Quest, you'll receive the top of the Ghost Robes outfit. After that, you need to find each of the other ghosts wandering around RuneScape to get the other pieces. Once you have the entire set, you'll be transparent! The full set adds a bonus of 21 to both your Magic Attack and Defence. A reward from the Mage Training Arena, Infinity equipment is better than mystic and ghostly. It provides +20 in both attack and Defence bonuses. It can cost much, so it's not intended for training, mystic can take it's place for that. One of the rarest magic equipment in the game, it is an incredibly rare reward from a level three Treasure Trail. Better than the Infinity top, it provides +2 more in magic attack and Defence bonuses. Rare and not intended for training, simple mystic or ghostly would replace it. Leather is the weakest armour in the game. It gives a very small Defence bonus. Hardened Leather is slightly better than regular Leather, but it is not a recommended armour. Leather armoured with small Steel Studs added, which can add additional Defence. This armour is still quite basic though. This armour is made from the hides of Bush Snakes while chopping away at the Tai Bwo Wannai Jungle. The hides can be tanned and crafted into Snakeskin Armour, which is slightly less powerful than Green Dragonhide and also heavier. Green Dragonhide is the basic Dragon hide armour for all rangers. It has much more Defence than leathers, offers good protection against magic and is quite lightweight. Blue Dragonhide is better than its green counterpart. It is Members-Only, but offers extra bonuses for Ranging as well as more Defence bonuses. Red Dragonhide is much better than its blue counterpart. It is Members-Only, but offers even more extra bonuses for Ranging as well as more Defence bonuses. A very good Ranger armour, which offers possibly the best magic protection and Ranging bonuses. One of the rarest range equipment in the game, crafted from white dragonhide, it provides better protection than a black d'hide body, but less than an Armadyl chestplate. Extremely rare, not recommended for training, any d'hide can take it's place. A rare drop from Armadyl's warriors, the chestplate is currently the best range top in the game. It is costly, but provides great bonuses, doesn't degrade like Karils and can take any place for any range equipment. Can be used for training, though any other d'hide can take its' place. Although they are smaller and offer less bonuses, they don't negate as much on magic and ranging. There are a lot of decorative hats around RuneScape that can be bought or found, but they don't give any bonuses. Made from Silver, they are so small that they give no real Defence, and all they do is give you an extra inventory space while Runecrafting. There are 2 main kinds of body armour: Chainmail and Platemail. Chainmail is made up of small rings connected together. It is particularly useful for turning away slashing weapons and absorbing the impact of a "crushing" attack. Chain is weak against stabbing weapons as small pointy blades can get through the rings. Chain is quite flexible, and so does not carry any disadvantages when using ranged weapons. Plate armour is much heavier and stronger than chain, although rangers and mages find it incredibly difficult to use in conjunction with firing arrows or spells. Plate armour is weakest against crushing damage as it cannot absorb the impact as well as it can against slashing or stabbing attacks. Rune Plate armour cannot be worn until Dragon Slayer Quest has been completed. The Square shield is weak against crushing attacks, but it neither penalizes nor bonuses ranging and maging. Not many know the advantages of this type of shield, so they are not very common. Kite shields have better overall Defence, but they are weak against stabbing attacks and slightly weaker against magic. Most people use these, and are easily obtainable. First shield you get from Tutorial Island, and it is pretty much worthless and offers no real Defence. After you arrive in Lumbridge, pay a visit to the Defence Tutor to obtain a Training Shield - a slightly better shield than that old Wooden one! This item (along with the other Training items) cannot be dropped or traded to other players. Extra-weak in all aspects, but it is the only shield that allows maximum protection against Dragon Breath. When you're fighting Dragons, bring this unless you want to be dragon toast! You can obtain these from the Duke of Lumbridge, in the Dragon Slayer Quest. Used to prevent being frozen by Cockatrices and Basilisks. It doesn't offer great Defence in other aspects. Better than a Rune Kiteshield and Square shield. It offers great ranging Defence and more Defence in the other categories. It's very heavy though, and it can drain energy quickly. This shield is a special kind of shield. Obtained after roving elves, this shield offers the best range Defence at 10/10 Points. However, it degrades itself over uses, and loses bonuses until it is repaired. This is a very expensive option, however. You must repair it at one of the roving elves. This shield can be bought from the Fight Pit Shop for 67,500 TokKul. It adds a decent Defence bonus, and it is particularly effective against ranged attacks. This incredibly rare kiteshield, is currently the rarest shield in the game, it is an extremely rare reward from a level three Treasure Trail. Less bonuses than a Dragonfire shield (charged), it provides great protection. More for bragging rights, a dragonfire shield or an obsidian shield can take its' place. The dragonfire shield is the best shield in the game when fully charged. A very rare drop from certain dragons, a dragon visage can be used with an anti-dragonfire shield to make a dragonfire shield(uncharged). For the shield to be charged it must be used in combat with a dragon, collected its' dragonfire. Each charge adds +1 slash, stab, crush and ranged Defences. Berserker shields are rewarded from the Fist of Guthix Activity. They degrade over time as they are used in combat, and are only tradeable once they are completely degraded. This type of shield comes in two varieties: Adamant, which requires level 35 Defence to wield, and Rune, which requires level 45 Defence to wield. This type of shield is one of four types of freeplay shields that grant a Strength bonus. Spikeshields are also rewarded from the Fist of Guthix Activity. They degrade over time as they are used in combat, and are only tradeable once they are completely degraded. This type of shield comes in two varieties: Adamant, which requires level 35 Defence to wield, and Rune, which requires level 45 Defence to wield. This type of shield is one of four types of freeplay shields that grant a Strength bonus. Gloves offer small Defence, but in some cases you need them to perform certain actions, such as picking up Nettles or Firebird Feathers. They may not have much Defence, but they look good and are often worth it. Regular Leather gloves are easy to obtain. They offer very small Defence and are considered worthless. You can craft these. Some people believe they give better bonuses, but they are just a different color, for looks. Obtained in various place around runescape, some are tradeable to free players (The Canifis Gloves). Ham & Fremennik Gloves as well as any other gloves fall into this category, and cannot be made. Although not the best gloves for mages, these gloves provide a decent amount of Defence. Vambraces are known as archer armbands, which are designed to make the user fire arrows longer, so it gives more Defence and range bonus than regular gloves. Dragon Vambraces offer considerable Defence and magical protection. Obtained from the ice queen in the Heroes Quest, these ice cool gloves allow you to touch hot stuff without harm. They offer a little better Defence than regular gloves. Rewards from the Fists of Guthix Activity, gauntlets give only Defence bonuses. They are the best gloves in F2P, all gauntlets are available to F2P except dragon gauntlets. Armoured Gloves are obtained during the Recipe for Disaster Quest. You can buy them from The Culinaromancers' Chest and are untradeable. The gloves armour is known by their color, although know as 'Gloves' in-game. They range from Normal, Bronze, Iron, Steel, Black, Mithril, Addy, Rune, Dragon and finally to Barrows. They are said to be one of the best gloves in the game. The most basic armour type for the feet. It is the only available feet protection for free players. There are many armoured boots across runescape, mostly bought from other players or from Slayer monsters. They give a considerable bonus Defence, but are heavier than regular type boots. Dragon boots are a rare drop from the Spiritual mage in the god wars dungeon, requiring a slayer level of 83 to kill. They provide much better bonuses than rune and have much replaced them with their arrival when the dungeon first came out. Bandos boots are one of the best boots in the game, it provides great bonuses but it's costs deflect that. A very rare from from General Graardor and his warriors. They can be substituted with dragon boots. Completed Saradomin and Guthix Prayer Books offer a small defensive bonus when worn, which can be useful in some cases. Remember, the Saradomin Book gives more Defence than a Guthix Book, while a Zamorak Book does not give any Defence. The ring of life protects you from death, which Defence is meant to do. All capes offer a small Defence bonus, but the best ones are Skill Capes and Fire Capes, which add Defence, Prayer, Strength and Attack bonuses. 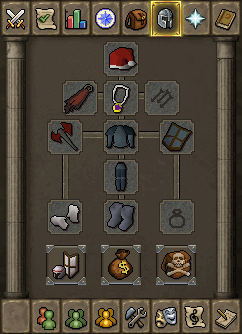 God Capes from the Wilderness Mage Arena, Obsidian Capes from Tzhaar, and the Legend's Cape from the Legend's Guild are also good. The Excalibur Sword, obtainable from the Merlin's Crystal Quest, has a Special Attack which increases your Defence temporarily. A great way to level up your Defence while practicing Magic is to use a staff. When you equip your staff, you'll have an option to set a spell or an attack strategy. Most people don't realize it, but even if you choose the Attack or Strength styles, you won't receive experience, although you'll receive Defence experience instead! This works whenever casting spells, and you can use this attack while attacking behind an object or fighting hand-to-hand. There are several items and other abilities that can temporarily increase your Defence. Protect From Summoning Reduces damage from opponent's summoning scrolls and ignores any familiars' special attack. Protect From Magic 100% Protection from magical attacks. Protect From Missiles 100% Protection from ranged attacks. Protect From Melee 100% Protection from melee attacks. Note: Protect From Magic, Missiles, and Melee have some exceptions in places such as Clan Wars or bounty Hunter. Please see the Prayer guide for more information.